About 22 miles west of Buffalo, this Lake Erie city is home to roughly 18,500 — but packs in more than 200,000 for its annual Canal Days Festival (Aug. 3-6, 2018). 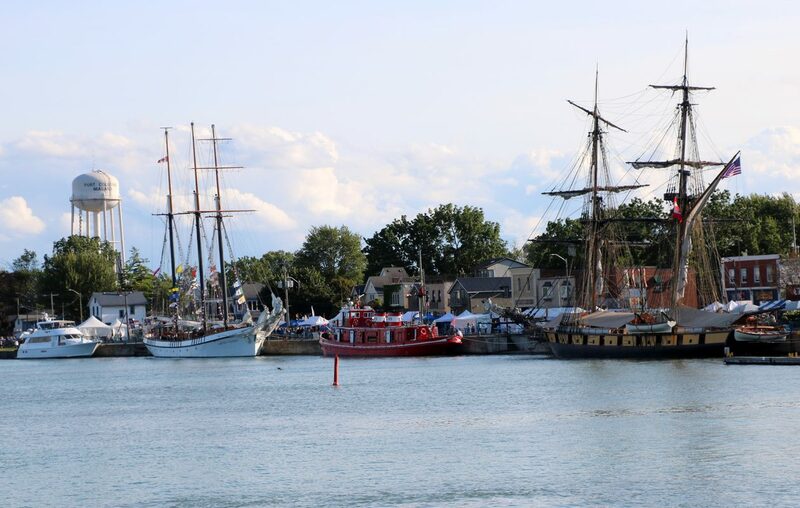 Called Port by locals, this city sits at the southern end of the Welland Canal, with the perks you’d expect of a waterside community in good weather, including the Port Promenade for walking, multiuse trails, bird watching (and bridge watching!) venues, scuba diving, and the chance to see the variety of ships that pass through. Accommodations are limited (check out the studio suites above the Canalside restaurant); some locals recommend staying in nearby Niagara Falls or Welland. Flying Squirrel Bistro, a yellow house at 27 Main St. West, features a vibrant color palette, large aquarium and wall of art-glass-lined windows, creating a trendy but comfortable atmosphere. The egg dishes, many called “eggers,” are popular; the brunch menu also includes smoked salmon, bread pudding French toast, caprese salad, warm brie, quiche, strip steak and much more. Tough choices, folks. We especially liked the shaved steak with caramelized onions, gorgonzola, mushrooms, poached eggs and horseradish sauce on a bed of spinach. The Smokin’ Buddha, in the old train station at 265 King St., is a favorite among locals. It won points with us when we arrived around 5:30 without dinner reservations, and a friendly waitress agreed to squeeze us in. (I promised we could be out by 6:15.) She seemed genuinely happy to make it work, and we kept our promise without feeling rushed. The Shrimp Pad Thai and Blackened Tilapia were tasty, and it was nice to be able to choose the Pad Thai’s heat level. Andie’s Boutique & Gallery, 244 West St., is one of several shops in the West/Main street area. Much of the inventory was created by Canadian artists and artisans, so it’s fun to see how their creative juices flow, whether it’s colorful wall hangings, penguin baby hats, quartz jewelry or etched glassware. Owner Andrea Birrell and her daughter, Emma Cole, were more than willing to chat about their offerings and other places to stop in Port. The Thrift Shop, 12 Charlotte St., is a Mennonite Central Committee store, where profits support international aid efforts. The inventory is varied and prices are reasonable. We picked up a long wooden TV stand for $5, and a solid wood chair for a high-top table for $15. Nickel Beach, on Lake Erie, is good for swimming, walking, windsurfing, picnicking and exploring sand dunes. Showboat Theatre Festival, at the historic Roselawn Centre, 296 Fielden Ave., offers professional theater productions throughout the summer. Lighthouse Tours depart from the Sugarloaf Harbour Marina. Available during Canal Days, Aug. 3-6.